Neon polishes have really become a thing for me this summer. Honestly, I blame my hesitancy on the incredible over-neonization that was the 80s. I'm dipping my feet in the shallow end of neon... experimenting with neon accents. Don't expect me to wear anything that's full-on neon just yet! The last time I was at Sally Beauty, I picked up the Orly Baked mini-polish set, Tropical Punch, and Va Va Voom. I figured I should probably swatch it, considering this is the 3rd time I've worn it in just a matter of a few weeks! 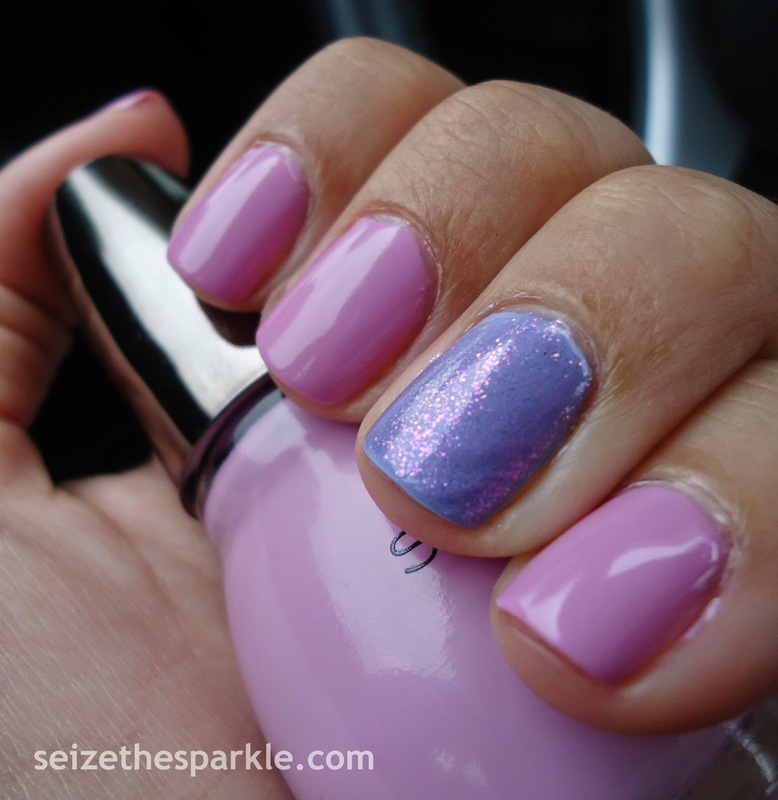 Knowing that I wanted to do an accent mani, and since Va Va Voom is so bright, I knew that the accent needed to be super sparkly and bright. So, I turned to Meet Me at the Disco, a recent TJ Maxx find, and one of the few holographic glitter polishes in my collection. Application was great for both polishes. Va Va Voom is ever so slightly jellyish, and I think that helps it glow, from the color to the finish! Meet Me at the Disco is a ton of small silver holographic glitter packed in a clear base. Super shiny and tres sparkly! I popped into Rite-Aid over my break yesterday, on a quest for the Sally Hansen Xtreme Wear Electric Summer Collection....... and found the NYC City Samba Collection instead! In addition to Jacaranda Flower, I picked up Sweet Melon, Ocean Blue, and Tropicoral. I knew I wanted to wear purple today, and since new polish is always at the forefront of my mind... Jacaranda Flower was the natural choice! Application was really good. I like the brush size on NYC polishes... not too big, not too small. I probably could've done just two coats, but my painting environment was humid, and I could've sworn I needed a third coat. I topped it off with a coat of clear followed by Seche Vite, and this time around... no smudges or re-painting necessary! Woohoo! The color is spot-on... don't you think? Such a pretty blue-leaning bright violet! Despite the fact that Jacaranda Flower comes from a summer collection, I think you could wear it any time of year, and it doesn't feel particularly trendy. But it is Limited Edition... so if you want it, I'd grab it while you can! The display in my store had $1 off coupons attached to it, so my polishes were just $.99!!! 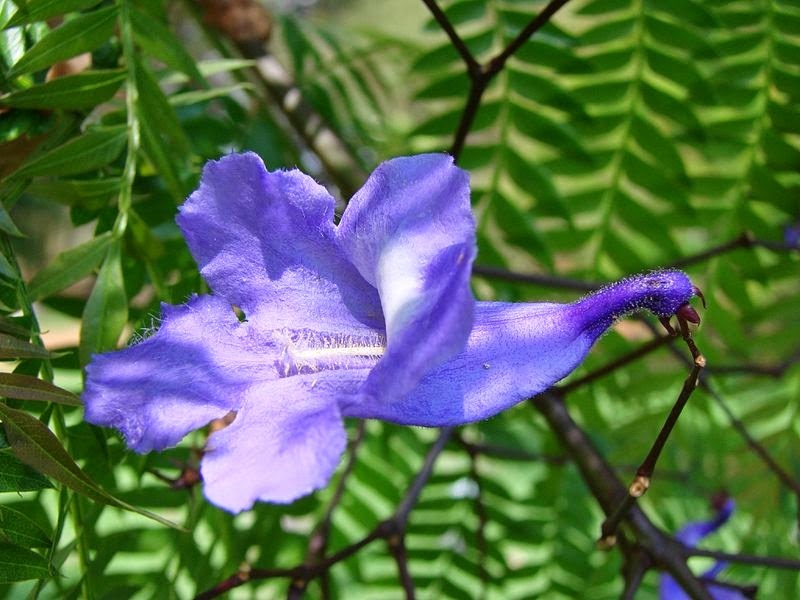 What do you think of Jacaranda Flower? Sweet Nothing is one of those polishes my Cybershot just can't seem to photograph correctly. It's teal, I promise! I'm not sure how, but the shutter of my camera ate alllllll the yellow required to properly view this shade. This manicure is totally one of those lemme pick a random bottle, paint my nails realquicklike, and go to bed. Yep. Three easy coats and off to marshmallowland. I just needed to plug in my phone, and... oops... forgot to pull out the plug in the Otterbox. No problem! I'll just use the end of my glasses, and... there goes the right thumb. It's okay, I'll just de-blanket and fix it... ooof... there went left middle. So, I removed the polish from those two nails and started over. Ridge Filler, Sweet Nothing, Sweet Nothing, Sweet Nothing, Clear, and Seche. Back in bed, plug in phone... sleeeeeeeep. Here's my attempt at a color-correct. It's still a little off, but it's as close as I can manage. 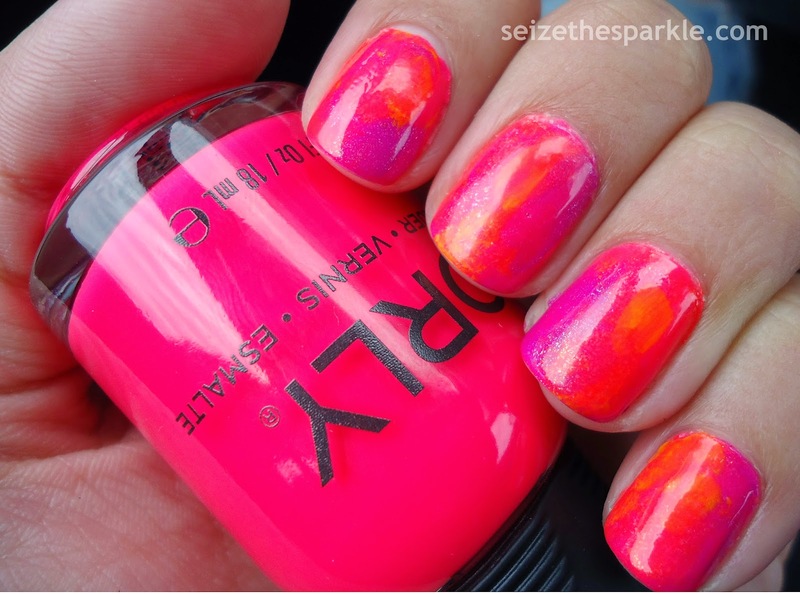 If you own Bright Pool from Gap... it's almost identical to that, minus the pretty purple shimmer. If you don't own it and want to re-create that look, I'm pretty sure you could top Sweet Nothing with Pink-Grapefruit from Sally Hansen, or NYC Sweet Candy. So, you can't really tell by my pictures, but Lay It On The Lime is bright... really bright, I swear! It's not a neon... more of a bright chartreuse. Take a tennis ball, tone it down a little, and that's the shade we're talking about. What do you think of Lay It On The Lime? Orly Saturated was the only member of my Orly Baked mini-mani set that didn't join the watercolor party... totally for a good reason, though! I wanted to do some sort of layering that incorporated all of the colors. Originally, when I purchased the set, I thought I would do a gradient of some sort. 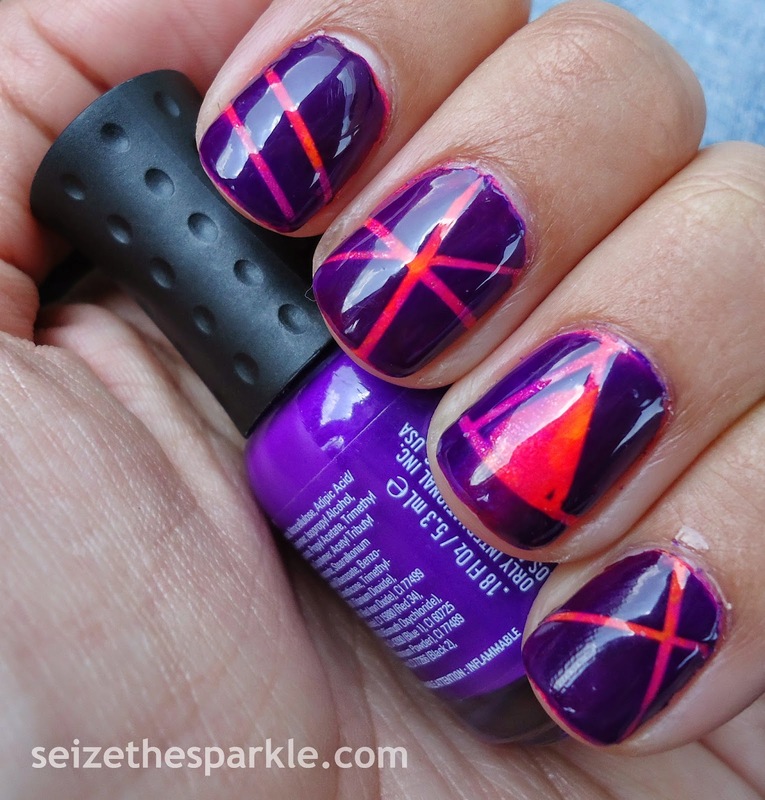 But, I've been wanting to try a striping mani for a while now, so... Bonjour, Saturated Neon! I mentioned this was my first time working with striping tape, right? It actually was really easy to use, it just took a little time and patience. Other than the two triangles, I didn't have a particular design in mind. I tried to be as random as possible while applying the striping tape, but I did actively try to make each nail different! I applied the striping tape to all my nails, then went back and trimmed some of the edges. 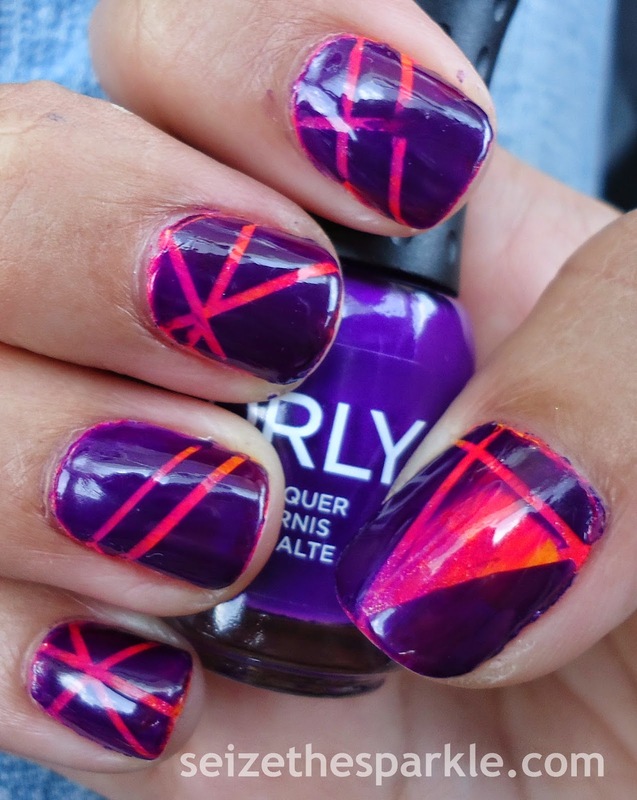 After firmly pushing down the tape onto each nail one final time, I brushed on 2 coats of Orly Saturated, removing the tape immediately after applying the 2nd coat. After about 5 minutes, I painted on 2 coats of clear, and a final coat of Seche Vite to set everything. For my first attempt at this type of nail art, I was really happy with how it turned out. Yes... my triangles got a little wonky, but they both got wonky, so it looks like it was planned, right? (Right!) Other than that, the pointer on my right hand is the only one that got a little polish underneath the striping tape, but it didn't turn out too badly. So, what would I do differently next time? I think I would stripe and paint one hand at a time. I'm pretty sure that would help quite a bit. It was hard to paint and take the tape off my nails with tape on my fingers, all the while trying not to smudge anything. Also, I totally forgot about using tweezers to help remove the tape. Oops. I started off with Orly Passion Fruit as my base. No real reason, other than the fact that it was already on my nails. (Sorry, I totally forgot to swatch it by itself! Don't worry, I'll wear it again, promise!!!) Using Ablaze, Hot Tropics, Tropical Pop, and Va Va Voom, I brushed on bits of color, sometimes allowing for dry time, occasionally blotting with a makeup sponge, and sometimes paintly immediately overtop with another shade. Lastly, I brushed on Va Va Voom near the base of each nail, and immediately added 1 coat of clear, dragging some of the pink across my nail to the tip. And just for reference, Orly Ablaze is a coral neon with gold shimmer, Hot Tropics is a neon purple with gold shimmer, Tropical Pop is a slightly orange-leaning neon yellow, Va Va Voom is a cool neon pink, and Passion Fruit is a warm, slightly red-leaning neon pink. And voila! A Watercolor in Neon!!! I'm actually kind of sad that this is only part one of two... I wasn't too sure how it would turn out, but I really like it, and have gotten some compliments! So, as much as I'll be sad to (sort of) see it go... Part two should look pretty damn cool, if all goes well... Stay tuned!!! Hot Tropics would be mine! Saturated would be mine! Ablaze would be mine! 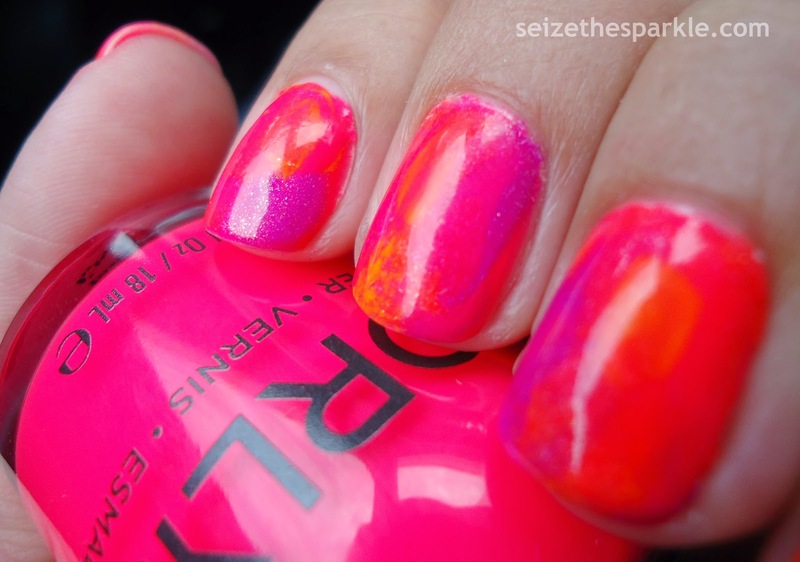 Neon Heat would've been more appreciated than Tropical Pop... but maybe I'll wear it, sometime? Most importantly... Hot Tropics would be mine!!! Mwahaha!!! 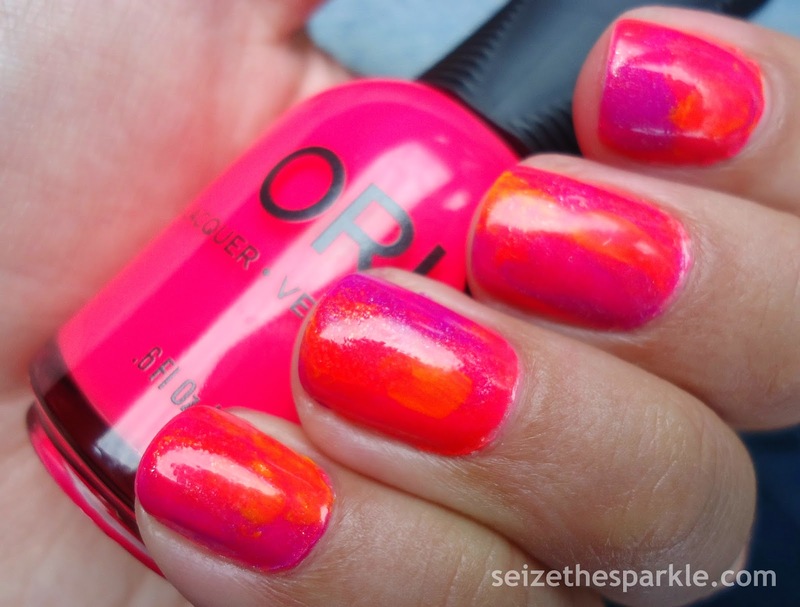 This is probably the first time I've ever said this, (which is kind of surprising, when you think about it...) but I think I still need a full size bottle of Orly Hot Tropics. And maybe a twin to keep it company? This shade is seriously gorgeous, and I have some major regret about not going over to grab it sooner! It looks gorgeous in pictures and was on my list of lemmings, but that's NOTHING compared to how it looks in person. It's vibrant, punchy, insanely neon purple that is just bursting with golden shimmer! Other polish companies should really take notes on Hot Tropics because it is thee perfect amount of shimmer! Let's talk application... I'm pretty sure I could've gotten away with 2 coats. The only reason I added a third coat, was because I was having trouble deciding whether or not I could see my VNL. Yep... Hot Tropics is that bright. 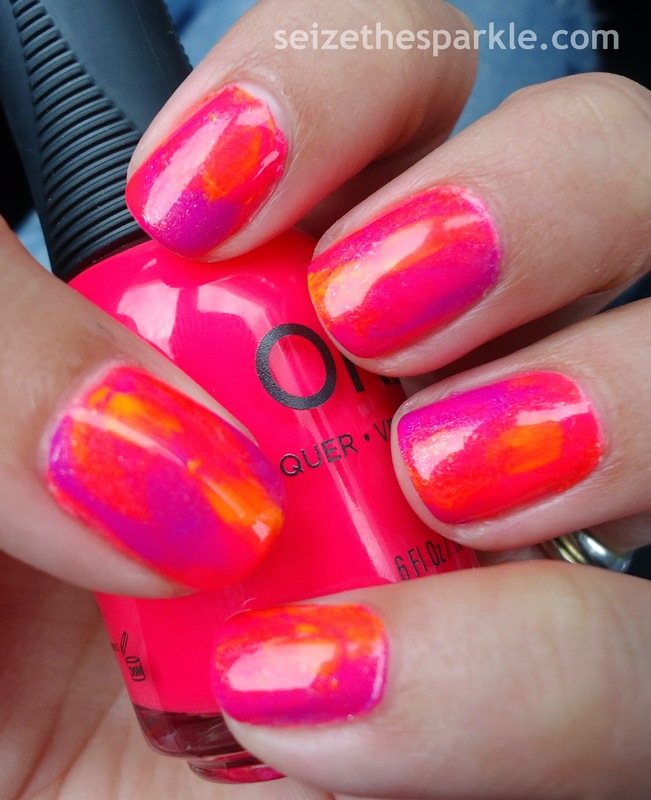 What do you think of Orly Hot Tropics? Last night was the first night my nail color has changed since SUNDAY... because I finally treated myself to a mani/pedi. I've never actually done that by myself before. It was nice! Lots of pampering and a professional's help with my nail shape, which I'm sure you'll notice! (OMG... they're all kinda the same size and shape now!!!) I got a more cream than tan color on my toes that I can't remember the name of... It was China Glaze, I think... maybe II or Inner Beauty? Je ne sais pas! I really should've written it down because I'm loving it! 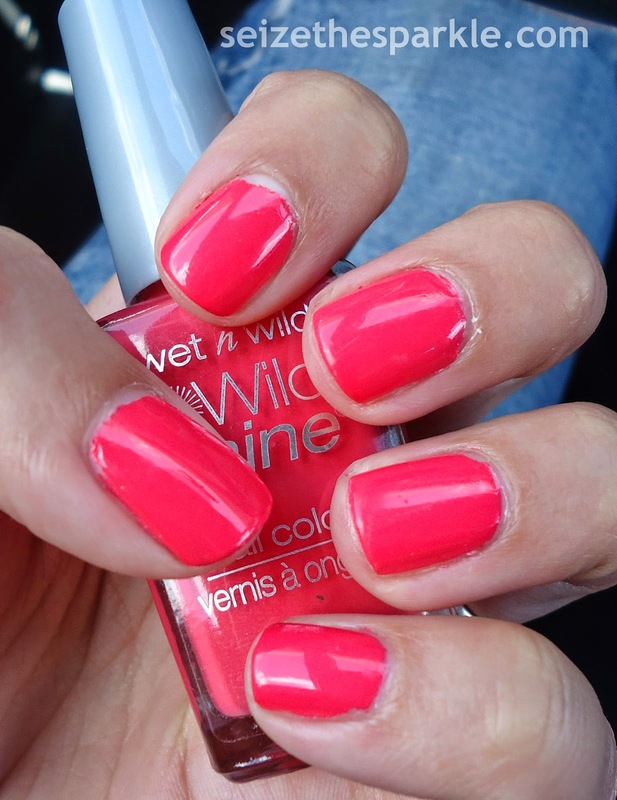 On my digits, I got a hot neon pink that was really fun to wear. I almost didn't want to take it off last night, but I had a chip on one nail! (yes, after only 3 days of wear!) So, I painted this mani last night in an attempt to cure myself of the no-more-neon blues. You know what this combination reminds me of? And I wasn't even trying to duplicate it or anything. 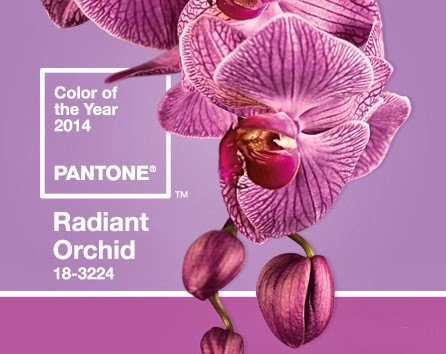 I wasn't even really thinking Radiant Orchid 'til I looked at it this morning! This was my first time using SinfulShine, a cousin to the SinfulColors line that boasts Gel Tech and a finish that is 5x shinier than... not another polish, but a patent leather shoe. That's a pretty bold claim, but Spitfire is really shiny. I guess a better test would include not topping it with a clear coat, in comparison to another similar product. Obviously, I didn't do that! Instead, I opted for an accent mani and paired Spitfire with a periwinkle creme from Urban Outfitters, largely because it sort of went with it, and it was in my sight range. (Hey, it's not always a vision that transcends space and time!) Also in the range of my eyes... Sally Hansen Pink-Grape Fruit. 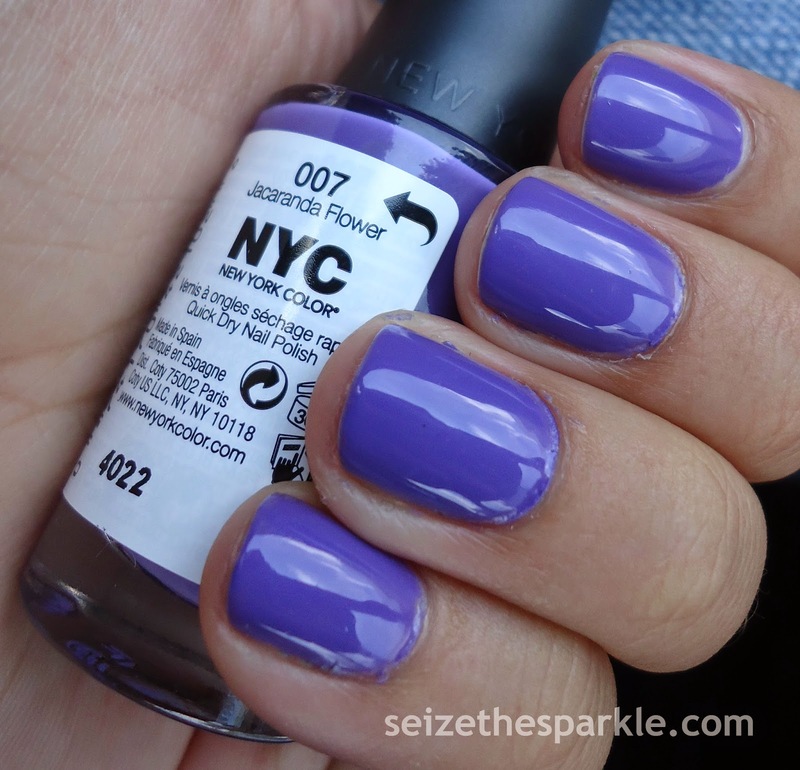 It houses a purply-pink shimmer (that matches Spitfire pretty well) in a super-sheer violet jelly base. Application was really good... for Spitfire and Pink-Grape Fruit... that Periwinkle Creme? Notsomuch. It suffers from the fate that a lot of pastels suffer from... chalky and streaky, but it evened out at 3 coats. It was a bit garrish looking, so that's why it got 2 coats of Pink-Grape Fruit slathered on top of it! In other news... Today, I satisfied my need for some neons in the sparklestash. 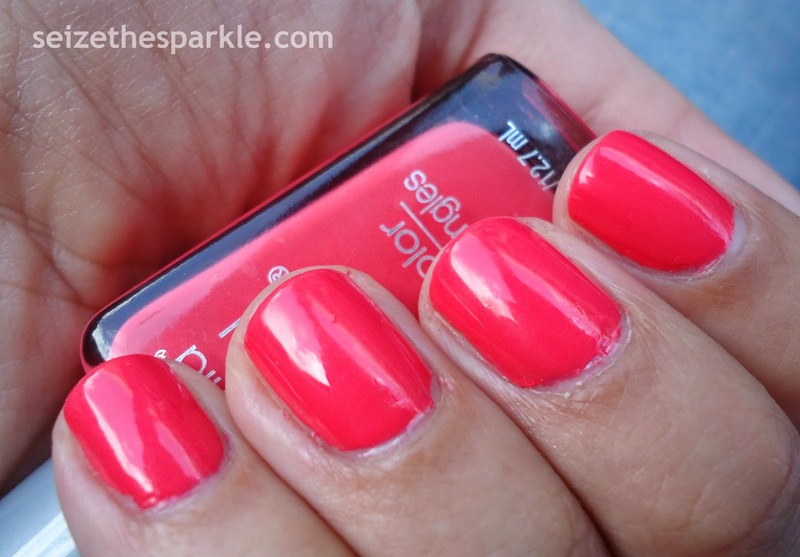 As much as I'd like to see how long SinfulShine polishes remain lustery and all... The neons are calling my name something fierce! There's a 98% chance I'll be taking this off tonight and going back, back, back, back, to the really, really brights. 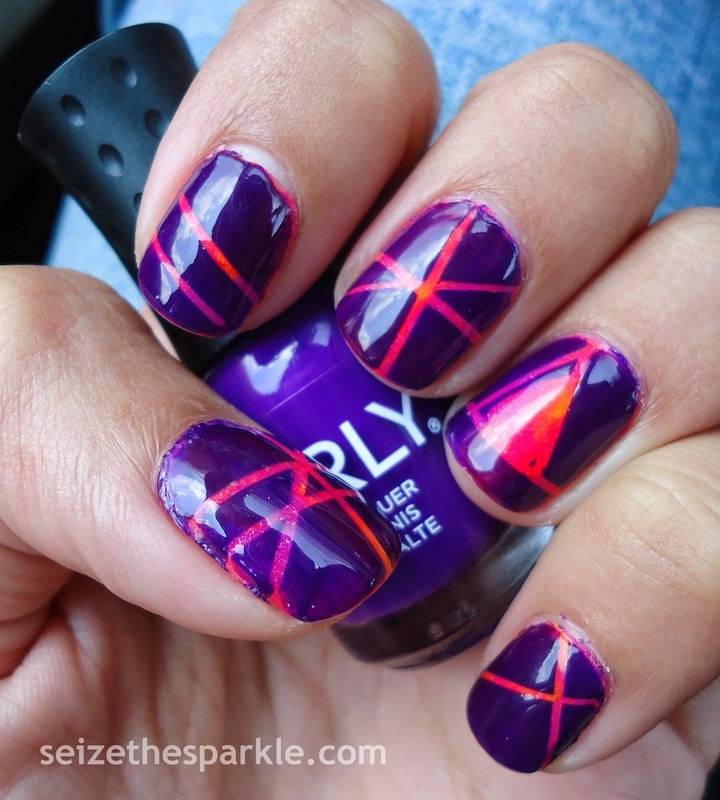 What do you think of this accent mani? I do realize that I have a lot of blues in my stash that are similar... but this one is definitely not like anything in my stash. It's almost a periwinkle, but not quite. It leans a little more to the lavender side than my pictures show, and it's really, really bright. Which. I. Love! 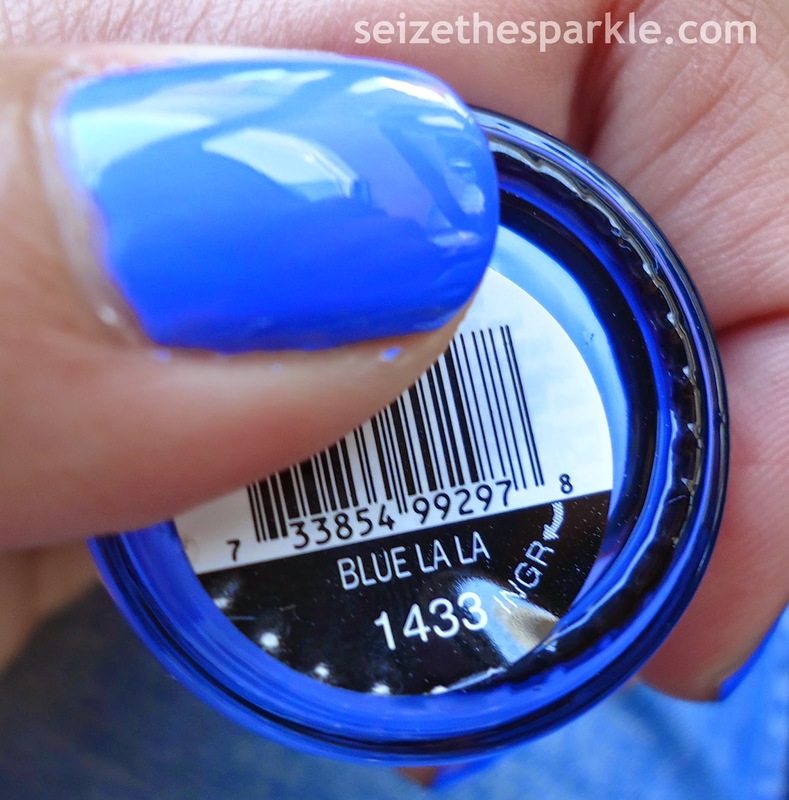 Blue La La is part of the SinfulColors Destination Color Chill Out collection, so I'd pick it up if you see it, while you have the chance. You never know if it will end up a repromote or a one time thing... and at $1.99 a bottle (or on sale at 99 cents) you can totally pick up a couple bottles at a time without hurting your wallet too badly! Have you picked up any of the new shades from SinfulColors?